The eight planned 20mm/90 Giat 20F2 were never fitted, there are 4 * 12.7mm/50 MG instead, two each side. In 2011, Sagaie CM were dismounted. 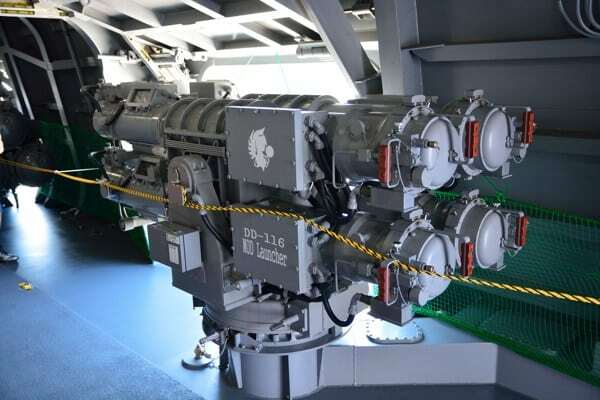 In 2015, a pair of Minigun have been seen aboard, not sure since when. "Le porte-avions Charles de Gaulle, Tome II, la vie à bord et le fonctionnement" (2003), SPE Barthélémy. "Le porte-avions Charles de Gaulle, Tome III, son groupe aérien embarqué" (2005), SPE Barthélémy. "Flottes de combat 2016", Bernard Prézelin, ISBN 978-2737363740. - "#2190 - DIBC-2A Vigy 105 -- Group, 1998, Tracker" is to be replaced by a "#5271 - EOMS-NG [CCD/IR/Rangefinder] -- Group, Sagem"
- provision will be made to install autonomous "#3165 - 20mm Narwhal 20B [M693] Burst [20 rnds]" along existing, manual, HMG. Could we get the USS Des Moines 1957 from CWDB put in here along with a "hypothetical" version with late 80s upgrades like this? Noticed "US" F-4D and Es (and also J/S models) in the 80s are still equipped with AIM9Js and AIM7E/Fs. Wouldn't the 80s loadouts have the 9L/Ms and 7Ms(Ps)? RAF FG.1s already have 9Ls etc..
thanks for any update to those.. Status: offline So no DB updates were included in v1.14.5, it appears. Looks like we're waiting until the next major campaign release, whatever/whenever that will be. Sometimes I get frustrated with what IS NOT present in the game, and then I find little things. Presently, I am building a scenario for the Evacuation of Hungnam... and found someone added demo charges to the weapons database, and now I can make blowing up harbor facilities part of the victory conditions. There is a lot of neat stuff in the game; you just have to find it. Status: offline Jane's: H-6J in service, at least 4 deployed. Weapons: Up to six YJ-12 AShM on the wing-hardpoints, and two KG800 ECM pods on outer-wing hardpoints. The US Defense Security Cooperation Agency (DSCA) has announced US State Department approval for the sale of three extended-range King Air 350ER business turboprops for use in Canada’s Manned Airborne Intelligence, Surveillance, and Reconnaissance (MAISR) programme. Announced on 4 October, the procurement will see the three aircraft undergo ‘customer unique’ modifications to suit them for the role, with their mission fit being listed as including L-3 Wescam’s MX-15D electro-optic/infrared (EO/IR) imager, Northrop Grumman’s AN/AAR-47B(V)2 missile and laser warning system and the BAE Systems/Extant Aerospace AN/ALE-47 countermeasures dispenser system. Other onboard equipment will include L-3 Communications Systems - West’s Vortex transceiver, Raytheon’s AN/APX-119 IFF transponder, the Rockwell Collins AN/ARC-210 transceiver, the KGV-135A communications security module, the KIV-77 cryptographic appliqué, and the KG-250X network encryptor. With associated tool sets, ground support equipment, airframe and engine spares, training, and logistics added in, the MAISR aircraft will cost approximately USD300 million. In programmatic terms, the Canadian Government initiated a US Foreign Military Sales (FMS) process relating to its MAISR programme in April which evolved into a two-stage process: acquisition of the platforms and their mission systems, followed by the announcement in June of its intention to let a future MAISR “complete programme” support services contract/s. Here, the support element will be tendered and is intended to maintain MAISR for a period of 20 years. Again, the MAISR capability will be deployed in support of Canada’s special forces. Coming hard on the heels of Costa Rica’s acquisition of an ISR King Air 350 during August 2018, Canada’s MAISR programme confirms Textron Aviation’s King Air 300/350 series of business turboprops as being amongst the world’s top ‘go-to’ airframes for the intelligence, surveillance, and reconnaissance (ISR) role. In this context, (and at the time of writing), Jane’s has identified no less than 47 such applications around the world that fulfill military and para-military ISR, and civil and military flight inspection roles, with user nations including Argentina, Colombia, France, Iraq, Kuwait, Mexico, Nigeria, Pakistan, Saudi Arabia, the United Kingdom, and the United States. •	Corner Brook will receive the upgraded Lockheed Martin AN/BQQ-10 (V)7 sonar processing suite (being the second Victoria boat to receive this fit, behind Windsor ), and an upgrade to the Mk 48 Mod 7AT heavyweight torpedo. The Royal Canadian Navy (RCN) diesel-electric submarine (SSK) HMCS Corner Brook is to become the first Victoria-class boat to receive a new modular communications mast. 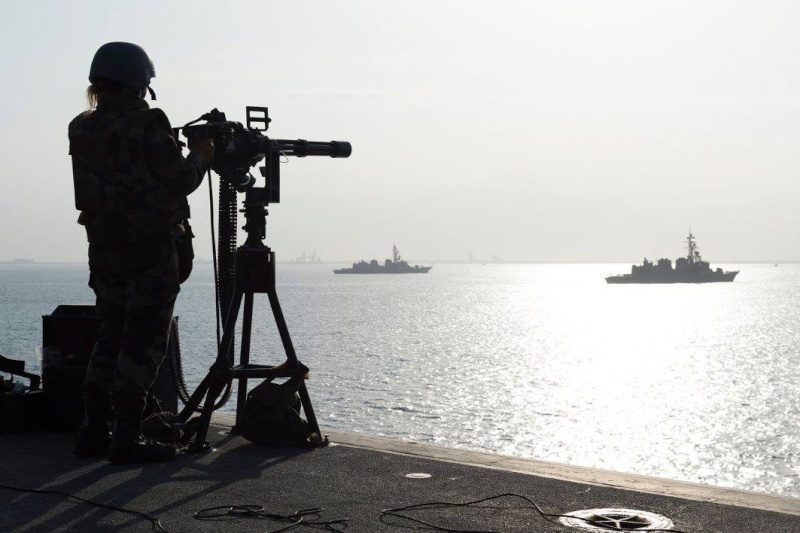 The L3 Calzoni Universal Modular Mast (UMM) has been acquired via the Foreign Military Sales (FMS) programme with the US Navy (USN). The new mast is being fitted while Corner Brook undergoes deep maintenance in an extended docking and work period (EDWP) at Victoria Shipyards in Esquimalt, British Columbia. Corner Brook will emerge from EDWP carrying two UMMs: one will be dedicated to an advanced extremely high-frequency protected military satcom (AEHF PMSC) capability, and the other will be available for additional mission fits. All four Victoria SSKs will receive the AEHF PMSC satcom mast fit; each boat will also be capable of operating an additional UMM, although only one submarine will carry the second UMM at any one time. According to RCN submarine force commander Captain Christopher Robinson, the UMM fit will provide a new capability for the RCN in delivering access to AEHF PMSC, providing high-speed, high data-rate, two-way communications. This will deliver “guaranteed capability [with] US highly protected, global, AEHF MILSATCOM”, Capt Robinson told Jane’s . The PMSC-capable UMM will operate using an OE-562 antenna providing two-way 256 kbps data rates. “This is a significant improvement to our current capabilities,” Capt Robinson added. The UMM is preconfigured for the payload, with the antenna attached once the mast is installed. An additional benefit of installing the UMM fit, said Capt Robinson, is that the mast is similar to those fitted to USN and other submarines. This means that “the engineering associated with payload integration of future capabilities is greatly simplified”, he added. Capt Robinson said the opportunity to introduce the AEHF PMSC capability determined the timing of Canada’s decision to introduce the UMM, with the mast being the enabling mechanism for the capability. Given the time needed both to develop the installation and engineering package and to conduct the fit, he added, Corner Brook’s current EDWP was selected as the first installation opportunity. Alongside the UMM fit, Corner Brook will receive the upgraded Lockheed Martin AN/BQQ-10 (V)7 sonar processing suite (being the second Victoria boat to receive this fit, behind Windsor ), and an upgrade to the Mk 48 Mod 7AT heavyweight torpedo. Corner Brook is scheduled to complete EDWP and return to operational service in 2020. Chicoutimi is next in line to receive the UMM fit. While Corner Brook is receiving its fit during an EDWP, Capt Robinson said that “ Chicoutimi is uniquely being considered for an install during an in-service materiel re-certification work period in the 2020–21 time period”. The boat will also receive the Mk 48 Mod 7AT torpedo and AN/BQQ-10 (V)7 sonar upgrades. Chicoutimi is scheduled to return to operational service in 2021. Chicoutimi recently completed a routine extended deployment to the Asia-Pacific region. The boat returned to service in 2015, having completed its first EDWP in 2014; it is scheduled for its second EDWP from 2026. An EDWP occurs after every nine years of operational service. In-service maintenance is conducted throughout this nine-year operational window, and can include a docking period at the halfway point. The combination of EDWP and in-service maintenance processes is designed to enable the RCN to upgrade capabilities on a regular basis as new technology options emerge, while also extending the life of the hulls and addressing system obsolescence. The RCN aims to operate the Victoria boats into the late 2030s. With Victoria-class operations proceeding at a steady pace, the RCN is also continuing with a long-term programme of upgrading the boats’ capabilities. Noting that the boats were designed in the mid-1980s to operate around the GIUK gap, Capt Robinson said, “We’ve sort of taken them and made them a more general-purpose submarine,” with a focus on long-range patrol and assigning a full range of taskings to them. Noting also the boats’ age of more than 25 years, ongoing modernisation work – carried out during EDWPs and in-service maintenance – is designed to deal with emerging capabilities that have come to the fore in that time, said Capt Robinson. “The boats go through large updates to deal with obsolescence in the EDWPs, but minor obsolescence issues, you deal with that in-service and we change things as required,” he said. “The biggest new capability that really paid off was BQQ-10,” Capt Robinson added. “The increase in processing power that came with [it] has just been phenomenal …. [It’s] moved the Victoria class ahead in a really large step.” The system provides the full range of active and passive sonar capabilities required to meet today’s, and tomorrow’s, ASW requirements, he added. Rear Adm Baines told Jane’s that “ Windsor itself brings one of the best sonars in the world to the table. Submarines, as you know, are absolute force multipliers because of their stealthiness and their ability to operate undetected. So, Windsor is a force multiplier in that respect”. Fourth-in-class Victoria boat HMCS Corner Brook is currently undergoing its EDWP. On returning to service in 2020, it will be the first Victoria boat fitted with the new Universal Modular Mast, bringing Protected Military Satellite Communications access capability. (Royal Canadian Navy/Department of National Defence) future capability upgrades will cover a range of systems, including radars and communications, Capt Robinson added. “One that I’m most enthusiastically anticipating is that Corner Brook will come out with a Universal Modular Mast.” This fit will bring access to advanced extremely high-frequency (AEHF) PMSC. In the context of the persistence and stealth a submarine brings to the fight, Capt Robinson noted, “having that reliable, high-speed/[high data-rate], two-way communications is going to pretty useful.” The other three boats will receive this new mast fit in their next EDWPs, he added. The Lockheed Martin Librascope Submarine Fire Control System (SFCS) CMS and the BQQ-10 sonar use a common console. The Lockheed Martin SFCS uses the TI-18 hardware standard – similar to the standard used by the BQQ-10 – but has been specifically adapted to support Canadian requirements, as well as the Mk 48 Mod 7AT torpedo. The boats’ electronic support measures (ESM) capability is being upgraded from the Sea Search II system currently fitted to all boats: further details on this upgrade are not currently available. For navigation equipment, all RCN ships and submarines are in the process of receiving the OSI Maritime Systems ECPINS Warship 6.2 electronic shipborne navigational system. All Victoria boats are fitted with the Type 1007 submarine navigation radar, although manufacturer Kelvin Hughes is supplying its SharpEye downmast system to replace the Type 1007. “Functionality tests have gone very well, and the systems will be installed over the next few years, as the upgrades won’t require major maintenance availabilities,” Capt Robinson said. The Type 1007 radar will be the last of the Victoria-class boats’ legacy systems to be changed out, he added. Status: offline About the ASM-1C, Japanese Navy(JMSDF but I call it as Navy) has one of that. Right now, it has 35nm attavk range. Compare to ASM-1, it does make scence but ASM-1C made up with SSM-1B. They where planned as XSSM-1B and XSSM-1C at same time as familiy weapon. 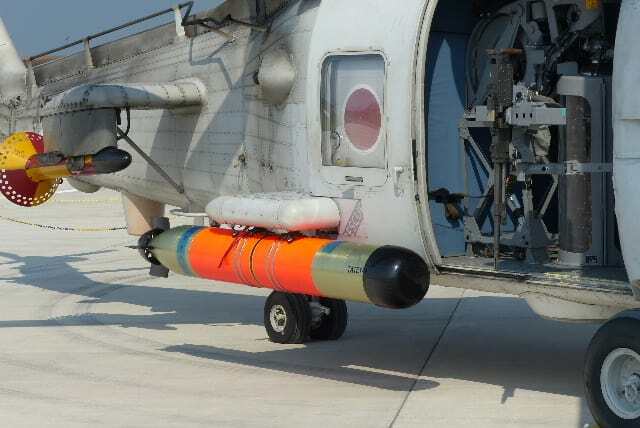 Japanese Navy decided to use ASM-1C because ASM-2 is just for F-4EJ and F-2A/B. So Can you guys change their Attack range to same as SSM-1B. 75~80nm? 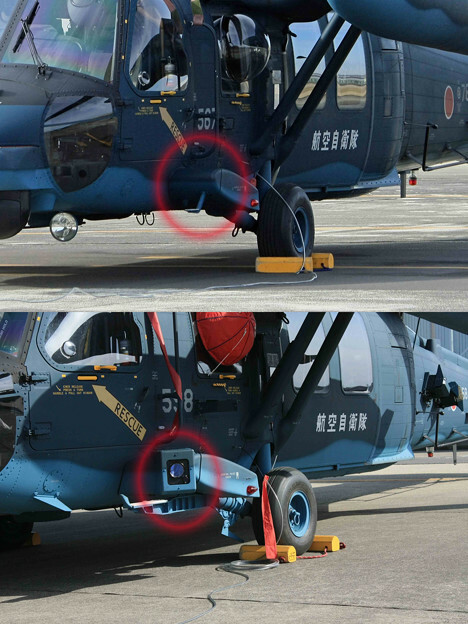 About the ASM-1C, Japanese Navy(JMSDF but I call it as Navy) has one of that. Right now, it has 35nm attavk range. Sure, I just need a technical or industry reference. Status: offline That is kind of problem, I have few, but they are only in Japanese. Still Japanese wiki said 150km so this is easy to see. And I still cannnot post URLs so sorry about that. Status: offline While I can't post any URLs I will put picture of P-1 with AGM-65F. Status: offline I'll add one more pic for P-1 with Harpoon. AGM-84D,The white one. The red and yellow one is ASM-1C. Status: offline Can the MQ-8B be added to the database for Taiwan? Status: offline JMSDF two new-class ships and one ROK Navy frigate. Could you add they to the database? Status: offline Someone pointed out that UK's F-35B has GAU-22 by default, and that's false. No F-35B has internal gun. Status: offline Can we get a hypothetical AT-6 Texan and A-29 Super Tucano for the USAF Light attacker program? They will acquire a good number of one of them soon. Can we get a hypothetical AT-6 Texan and A-29 Super Tucano for the USAF Light attacker program? AT-6 Texan? Those aircraft are over 70 years old! I doubt they would be even considered for that program! Status: offline AT-6 light attack from T-6 TexanⅡ is the aircraft he wants to say, I belive. AT-6 light attack from T-6 TexanⅡ is the aircraft he wants to say, I belive. Status: offline Also. Any chance of adding the Chinese Type 001A carrier? We may not have perfect information but it will be commissioned within a year and most relevant info is published. There is also the KJ-600, a derivative of the Y-7 that is meant to be a carrier AEW aircraft like the E-2. Apparently it is in service already but since you could never get it working on a Ski Jump carrier it must be shore based until the Type 002 carriers are built. Someone pointed out that UK's F-35B has GAU-22 by default, and that's false. No F-35B has internal gun. As I recall the UK F-35B does not mount a gun. Weird factoid - UK Typhoons have cannon but they aren't 'enabled', ie loaded or even trained with. In the DB3000, the AN/AWW-13 Datalink Pod description is wrong - it's for an AN/ALQ-220. As I recall the UK F-35B does not mount a gun. I don't know if the UK will stock inventory of gun pods, but UK F-35Bs will 100% be capable of mounting them if required / provided. "Of ACCs three bomber types, only the B-52 carries the AGM-142 missile. It is carried externally on the Heavy Stores Adapter Beams (HSAB) under each wing. Each HSAB can carry two missiles or one missile and a DLP. The DLP is normally carried on the aft station of the right HSAB. For single ship operations, the Buff carries three missiles and a DLP. For formation deliveries, total of four missiles can be carried by each aircraft with at least one aircraft in the formation carrying the DLP and serving as the missile controller for the whole flight." Therefore for each AGM-142 loadout on the aircraft, there needs to be a 3 missile w/1 DLP loadout, but also a 4 missile loadout, and the capability of the DLP to control multiple missiles simultaneously from multiple aircraft. JMSDF Akizuki-class has FAJ(Floating Acoustic Jammer) and MOD(MObile Decoy) and removed AN/SLQ-25 Nixie. Akizuki, Asahi,Izumo, Maya-class has this system. (you can see that on each Wiki page. As you can see, submarines also have MOD for self defence. MOD is just beside 324mm HOS 303(Mk32). Japan replaced some Mk46 by Type-97 LWT(so from 1997/DBID:314) and then Type-12(GRX-5) LWT(from 2012/NOT SSM). They replaces some ship( witch have HOS-303),all Aircrafts(P-3C, SH-60J/K and P-1) LWT. But They still have capable of Mk46 after the replacement. Ships with HOS-303 are Hyuga-class, Akizuki-class and Asahi-class for now. So can you change that? 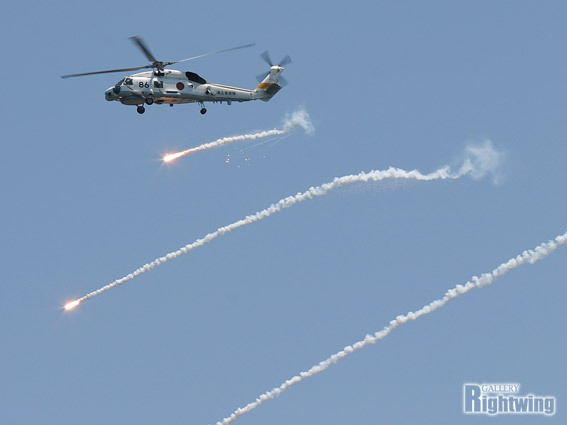 Just for example of SH-60K using Type-97 or 12. Type-12 LWT is new Torpedo so No detail infomation even in Japanese. Type-07 VLA system replaces RUM-139 VLA.Warhead is Type-97(2007-2012) or Type-12(2012-) LWT. Akizuki, Asahi, Maya-class has Type-07, but Akizuki-class starts equip from DD-116 Teruzuki. Improved range and using Type-97 and Type-12 for deeper and more silent target. There not a lot of info, but you can find the name just above the "New Panch". For correct info of Akizuki-class: This might help. You can DL the pdf file. The VLS also houses vertically-launched ASROC (Anti-Submarine Rocket) missiles. deployed by an embarked sea control helicopter. developed from the late 1990s onwards by the TRDI under the designation GRX-5. And here is new of Asahi-class info. For additional info for Asahi-class, that is specified for ASW mission. improved OQQ-24 sornar system and OQR-4 TACTAS. And equip FAJ and MOD for anti-torpedo system. Asahi-class's OPY-1 radar is based on FCS-3A for Akizuki-class but removed LAD(local Air defence) function. Newest Soryu-class sub, Oryu now remove AIP and lead-acid batteries and put Lithium-ion ons. This makes faster and bigger capasity size of the battery. Picture underthere is from above two. You can see ASM-1C is same generation of SSM-1B. "Further, ASM-1C's specific function, launch from longer maximum range of Harpoon missile,"
So ASM-1C's maximum range is 100nm, same as SSM-1B. We can find The site of Sniper XR at Lockheed Martin's over view. We can find F-2 has variants Sniper ATP. According to this infomation, Japan bought Sniper XR from 2015.
and ASM-3 with AAM-4 and AAM-3/5 and 600 gal tank 2 of each of them. No longer using cluster bombs. For F-2 after 2009. So can you guys delete CBU's from load out from 2009? This is from his site. And GBU-39SDB for F-35A You can find name of Japan.